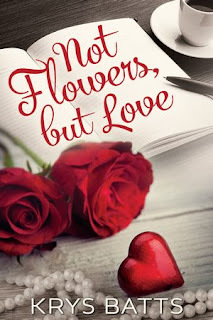 Not Flowers, but Love finds an ambitious professional, Jamie Dubois, using her job in Houston, Texas, to escape her calamitous history with men and love. Nothing has ever gone as expected and no one has ever turned out to be what he seemed. So Jamie has given up – at least for now – on the whole idea of marriage and white picket fences. Since her last, hardest heartbreak three years ago, Jamie has mastered the art of controlling her emotions, usually by abstaining from any form of romantic entanglements. But in recent months, she’s been dipping her toe into dangerous waters, entering into a long-distance dalliance with a handsome man named Ken, whose own career is taking off. Since Ken lives in Miami, Jamie doesn’t worry too much about getting overly attached to him, although their easy conversations and charged sexual encounters often stir her long-buried fears. Still, she reasons with herself that she is in control, keeping love at an emotional distance that mimics their geographical separation. But Jamie’s safety net is soon reduced to smoke, being abruptly yanked out from under her when Ken accepts a new job in Houston with Jamie’s employer. Not only is he now local, but he’s her newest colleague, and Jamie’s predictable life turns into a shaky one. Before long, everything she’s come to rely upon vanishes—and everything she wants becomes everything she can’t have.